Janine and Ellen thanked the previous Officers for their service and gave them each gifts. Dues are $40 per year for each member. With that money, we pay the national guild and fund projects in our guild. If you did not pay at the January meeting, please bring cash or check to the February meeting. 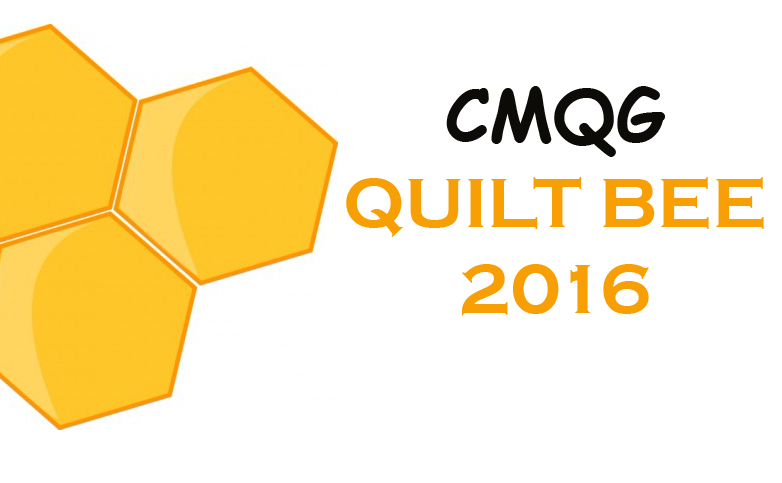 Members of our guild pieced together a charity quilt for QuiltCon. The quilt was pieced together using an "improv with intent" method. 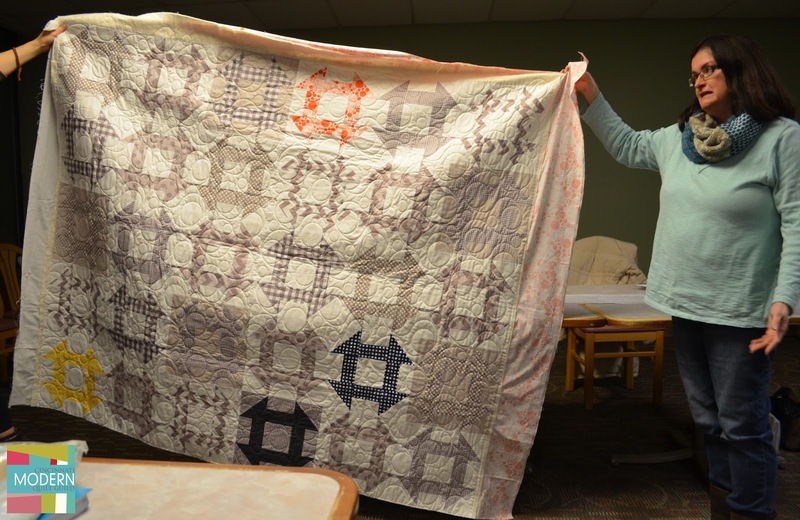 It quilt depicts the seven hills of our area. Ellen reported she had to rip out part of the top quilting and re-do portions of it. She'll have it ready to show at an upcoming meeting. There is a backlog of finished quilt tops that need to be finished. 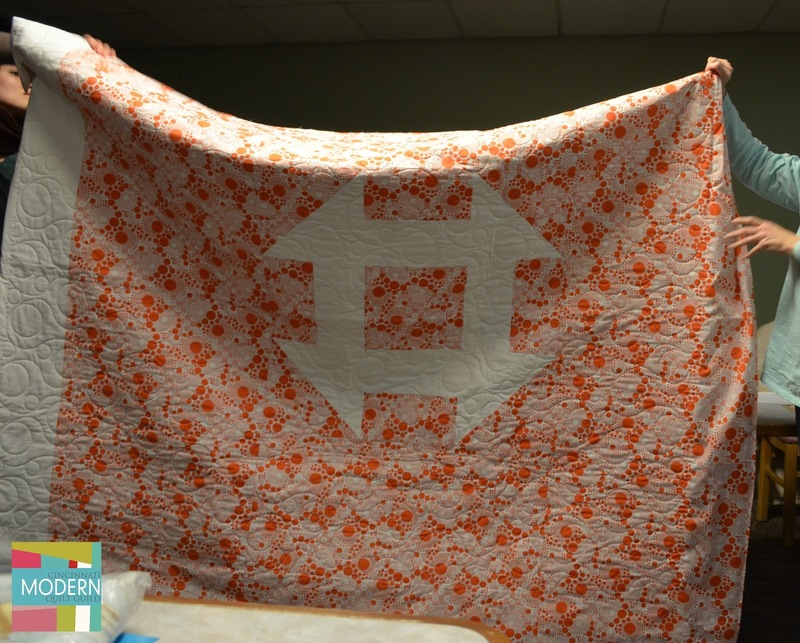 Ellen will bring the quilts to the next meeting and ask for people to take them and finish them. 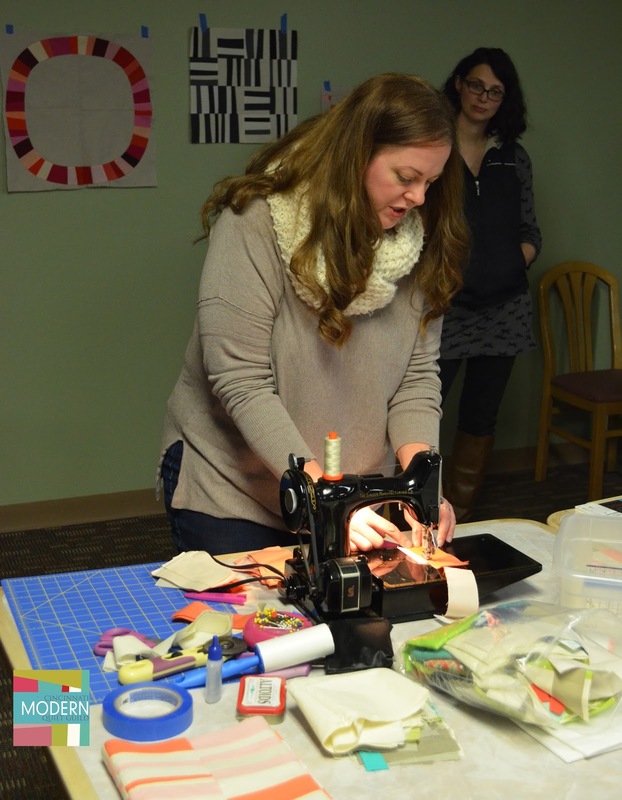 The Cincinnati Public Library has a new Maker Space at their main branch, 800 Vine Street, Cincinnati, OH, 45202. The Maker Space has some cool equipment like a 3D printer, a laser cutter/engraver, sewing stations, and a vinyl printed/cutter. We have scheduled a tour on Tuesday, February 16 at 2:30 p.m. Everyone is welcome to attend! Then, our Sew-In is scheduled for that following Saturday, February 20 from 9 a.m. to 2:30 p.m. in Room 3B. Bring surge protectors and extension cords with you. Parking for the Main Branch Library is available at the metered on-street spaces and at several pay garages or surface lots. Abby finished her Betsy bag! 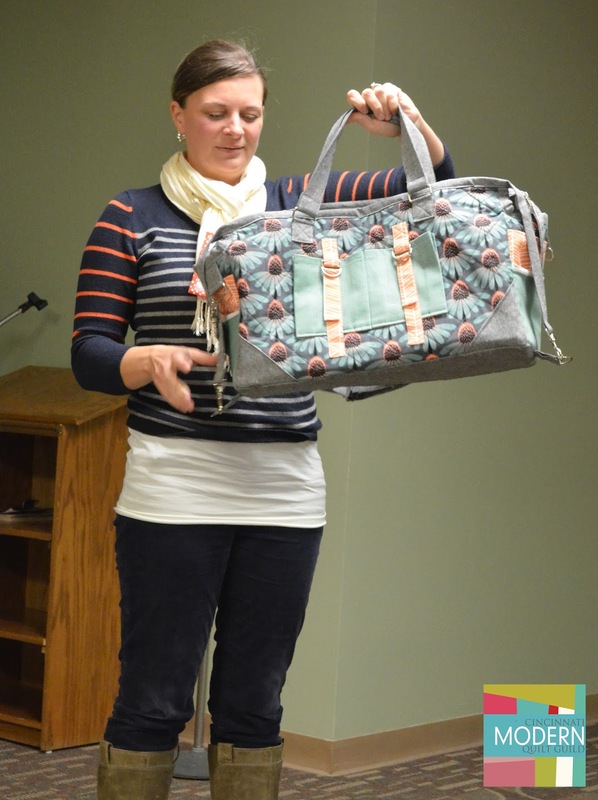 She also showed two recent completions: Sew-Together bags. Christine showed her finished tree quilt. 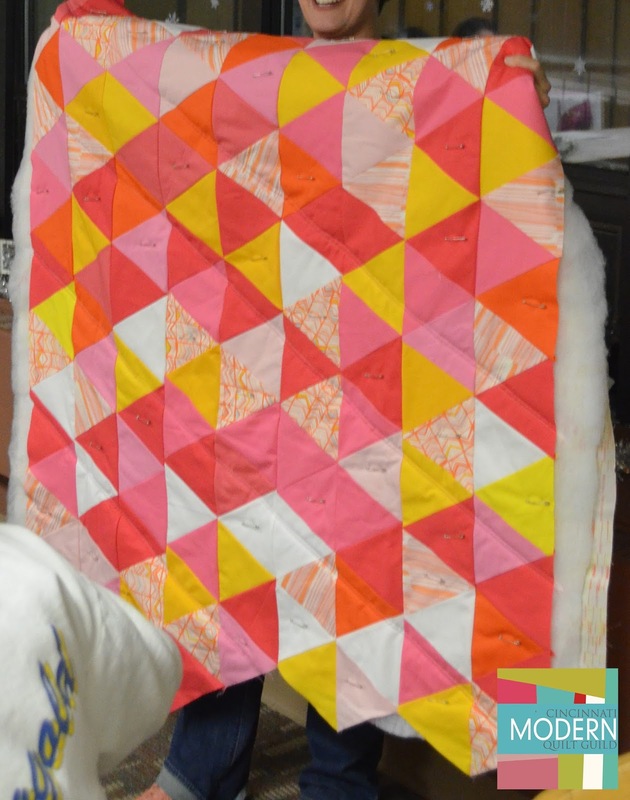 Robin made this triangle block quilt for her sister's baby. Sheila made this modern take on the churn dash. 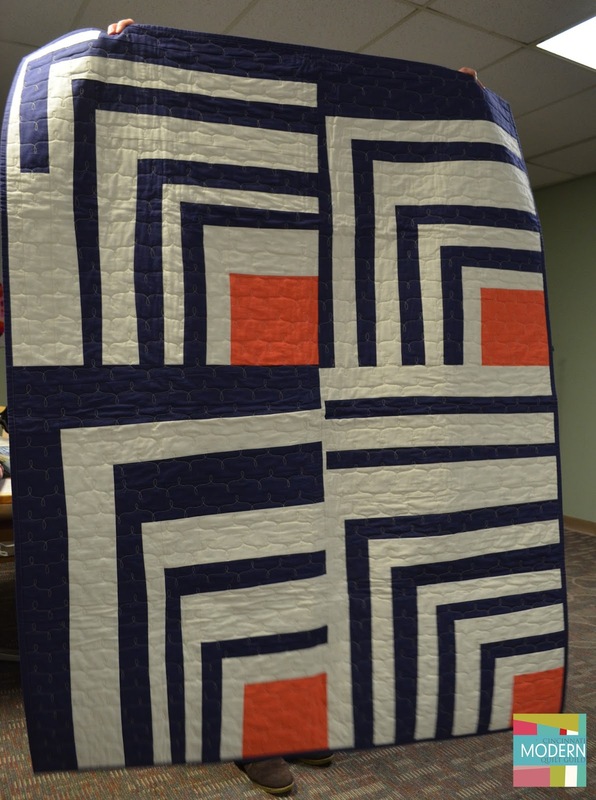 She quilted it at The Quilter's Studio in Loveland. This is the back of Sheila's quilt. 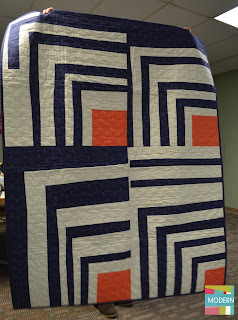 Brooke made this quilt for her brother-in-law and Annie did the quilting for her. Annie is gathering Raspberry Kiss quilt blocks to make a Quilt for Comfort for the widow of a local firefighter. 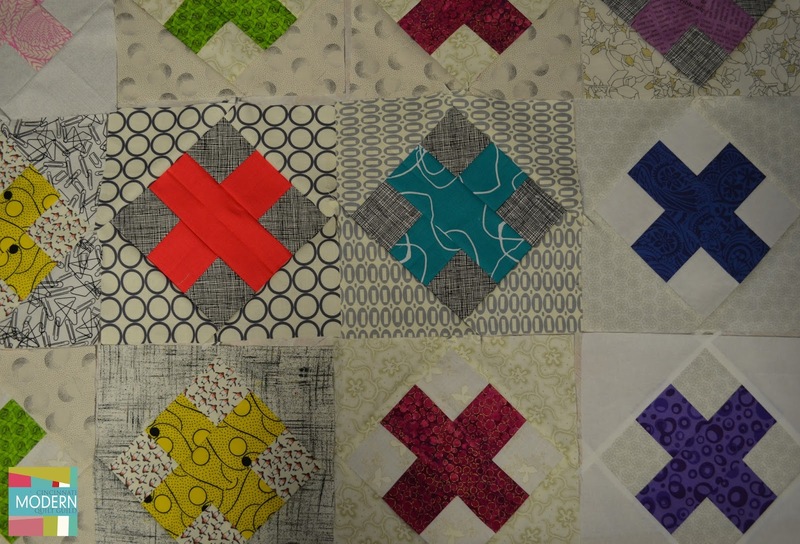 The blocks are to be made with jewel tone centers and low volume - make a 9 inch block that will finish at 8.5 inches. 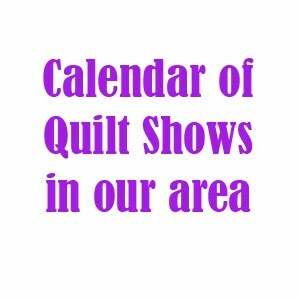 Annie will be collecting the blocks at the February Guild meeting. 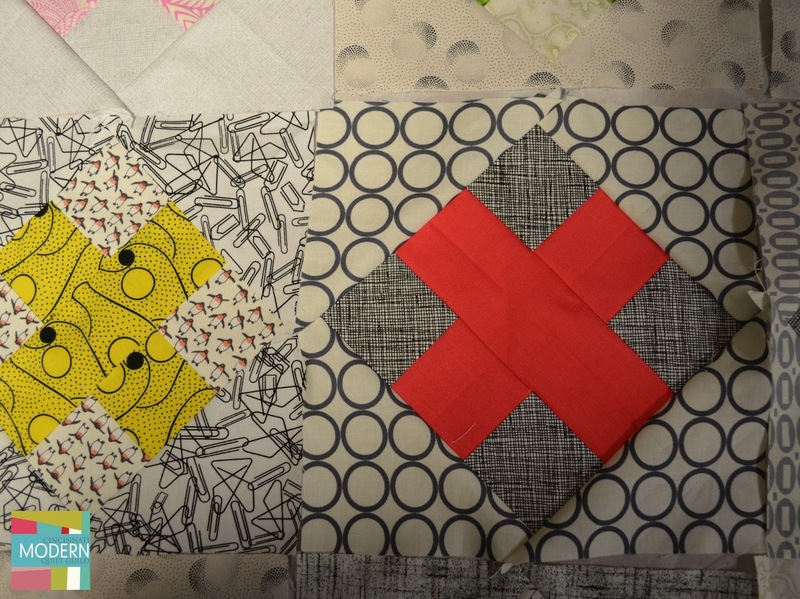 She's hoping to collect enough blocks to make two quilts - one for the firefighter's wife and one for his mom. 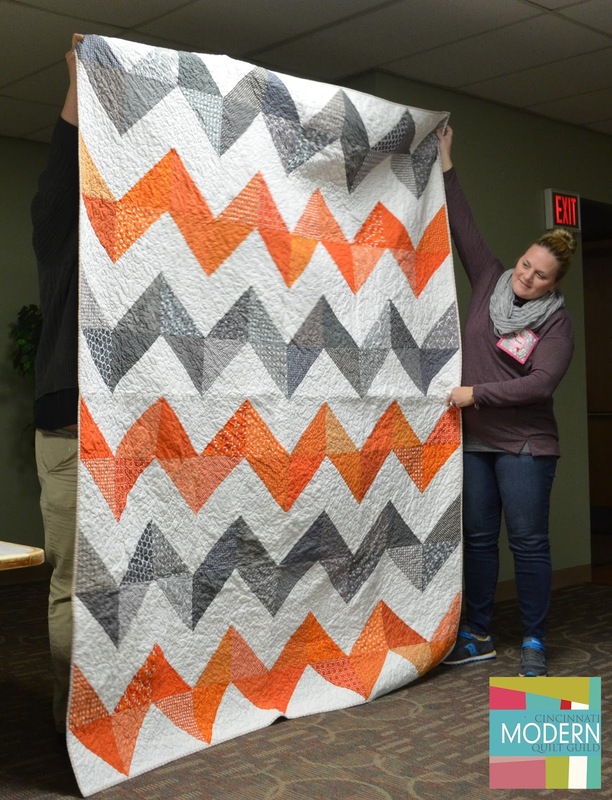 Search the hashtag #quiltforcomfort on Instagram to see more examples. Heather Jones shared her great tips on improvisational quilting! 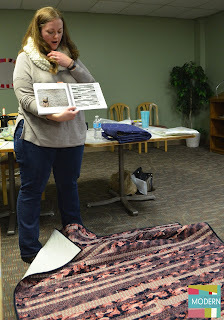 Heather defines improv quilting as not following a pattern and really just doing your own thing. 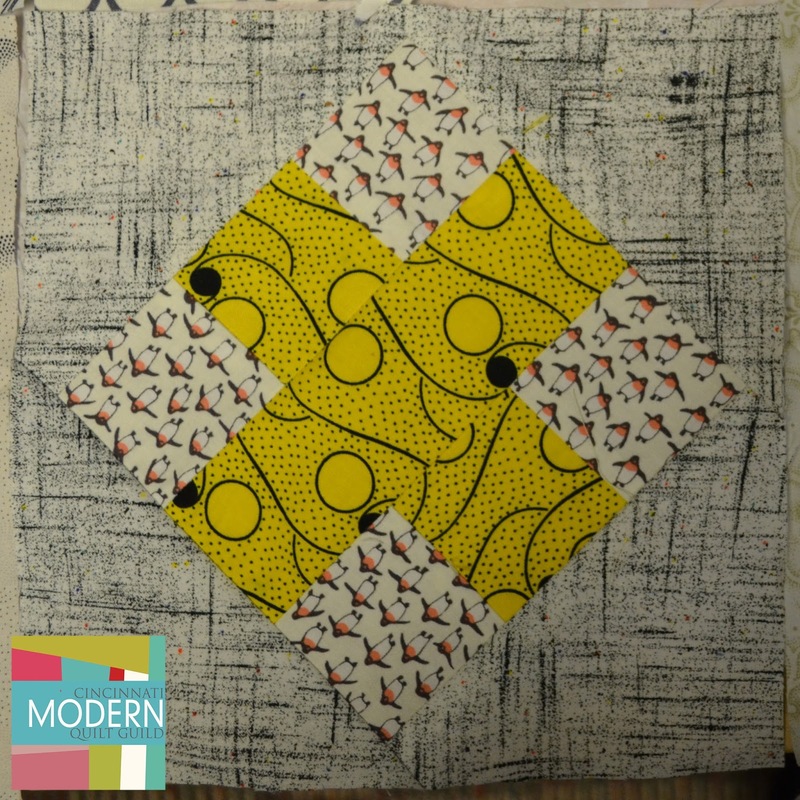 Improv work all looks different because of the quilter's personal style and aesthetic preferences. 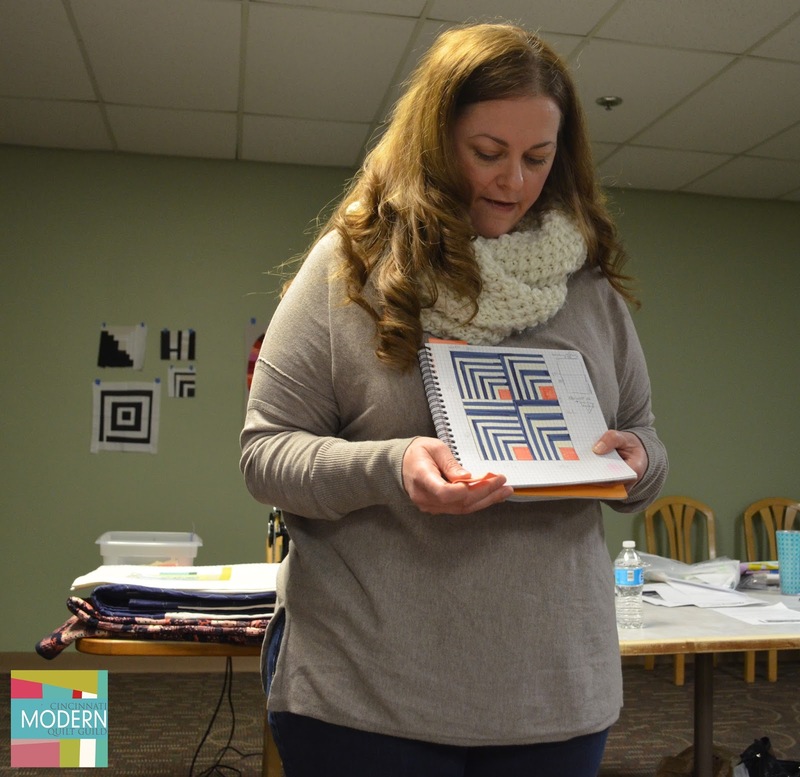 Heather begins her improv designs by sketching them in her notebook and she said she does not follow a strict set of guidelines when she's designing. 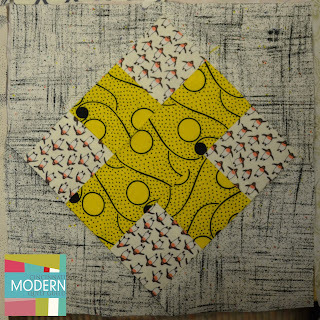 Another sketch design Heather showed from her notebook is her Kent Quilt, which was inspired by tiles in a bathroom. 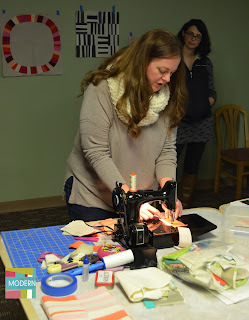 Heather uses eyeball measurements when she is improv quilting, not precise measurement. She uses scissor to cut, or a rotary cutter, and sometimes uses a ruler. One piece could have both free form cutting and ruler cutting. Improv quilting is not messy quilting, Heather emphasized. Use solid construction, pin wheel and iron to avoid unintentional wonkiness. 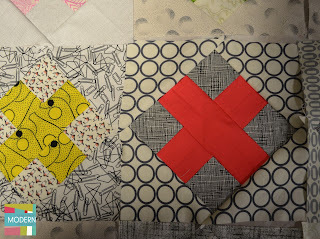 In improv quilting it's not necessary to use a quarter inch seam allowance. 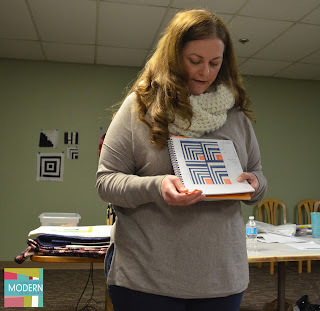 Heather teaches online at CreativeBug - click here to see her classes. 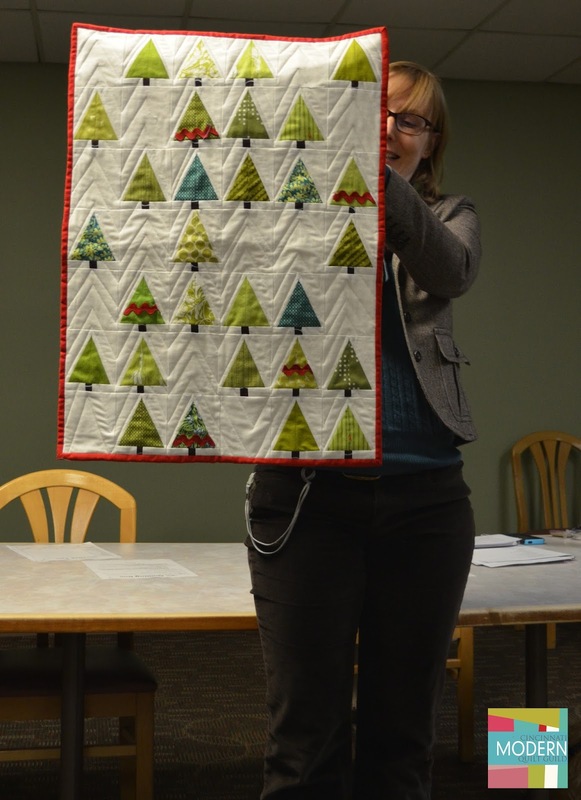 Heather's book, Quilt Local, is out now!